What really separates Columbus from the big league cities like Chicago? The void is not in sports teams, accents, sitcom settings, or cool city nicknames. The true difference is food. Ever hear of a Columbus style hot dog, pizza, or anything – neither have I. You can taste the differences between the food from the “big cities” and our homogenized fare. Expand your palette. You don’t have to take a road trip to visit Chicago – just head toward Polaris for a bite at Wholly Joes. Wholly Joes has the authentic tastes of all the hot spots in the Windy City – hot dogs, Italian Beef sandwiches, Deep Dish Pizza, tamales, etc. Let’s lead off with the Chicago Style Deep Dish Pizza. First thing you need to know is that its is only available evenings and weekends. Second, plan on waiting at least 30 minutes when placing your order. Third – it is the best Deep Dish Pizza you can get in Columbus. Wholly Joes uses dough made from scratch, an authentic 1951 oven (made specifically for Deep Dish Pizzas) and ingredients shipped in from Chicago to get everything just right – and – it is. The hot dogs come from a famous Chicago hot hog maker and are served Chicago style with mustard, relish, chopped onions, sliced tomatoes, cucumber slices, a sliver of pickle, and sport peppers on a steamed poppy seed bun. The bread comes from the famous Turano Bakery in Chicago and is showcased in the buns used for the Italian Beef Sandwiches. If you want to go all out get the Wholly Joe – which is 1 1/2 times the size of the regular sandwich. 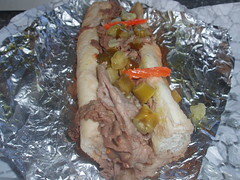 An Italian beef sandwich is made with thinly sliced beef, cooked in natural juices, served in a bun with a choice of extras including extra gravy, cheese, peppers, hot giardinera mix, grilled onions, and if you want, the whole sandwich can be dipped in the beef juice. There are many other choices at Wholly Joes but one more that I must mention is the chocolate cake – moist, dense, and a customer favorite. This eatery is located on Polaris Parkway. in the Oak Creek Shopping Center. one mile East of U.S. Rt. 23. or two miles West of I-71. This entry was posted on January 7, 2007 at 1:48 AM	and is filed under pizza, restaurant reviews, restaurants, sandwiches. You can follow any responses to this entry through the RSS 2.0 feed. You can leave a response, or trackback from your own site. One of the best kept secret’s in the Columbus area. I love this place and get a dog or two to go every week. Don’t forget to order the onion rings, done with a tempura like batter, light and crispy. The italian beef will make you think a second time about ever driving up to an Arby’s again. Deep Dish pizza here (served in the evening, takes a while to order (made fresh), but it worth it! Wholy hot dog, Batman. Yeeeeow-za. There you go again, Gourmie, knockin CMH, I mean it’s true, even Cincy and C-land got more street cred than the Capital, but so what? Columbus has got a lot of character hidden beneath its vanilla-packaged-by-Borden-go-bucks exterior. I’m glad you’re out there reporting on these places. But tell me is the beef good? I know that you know. Is it Scala’s, or do they do it in house? I do beleive that every town should have a beef joint, and I’ll go for a good sandwich, but I’ll pass on the pictures of the Al Capone and and murals of the silouetted skyline(if they have those things). I’m not knocking this town – I am talking culinary history here – Columbus does not have a food unique to itself – Chicago and NYC do. So does the South – not a diss – just a fact. And as the guy that I had 10 Beefs in one day with you in Chicago – the Wholly Joe is about a 6.2 on our beef 10 point scale. It is no (Italian Village) Al’s #1 or Carms but it gets the job done. It should have been a bad sign when there were only a handful of people in there on a Saturday night. Unbelievably bad service, and pretty bad pizza, too. I had been craving deep dish all week, so searched on line and found this place. We ordered onion rings to eat while we waited for our pizza. When they called our number, I was handed a greasy little paper bag. I looked inside to see the rings, looked OK. When I asked for plates so we could have some ketchup with our rings, I was told that I would be brought plates when the pizza comes out. OK…??? I went back to the ordering counter and asked again for plates, and was given some tiny little barbie-doll sizzed plates. Then, the pizza came out (and finally, the plates). The only thing deep about it was the greasy, salty, rubbery cheese. Oh, and the ring of flavorless, pale crust around the edge. Nothing like the deep dish I remember. So, then I went back to the rude little man at the counter and asked for a box to take the leftover pizza home (why? I’m not sure…) He gave me a box that was clearly too small for our pizza. I asked if he had a bigger box, and he said, “well, how big of a box do you need? ” I replied that I needed one big enough for the 14 ” pizza. He said that was what he had given me. I’m not an idiot. I could see that it clearly wasn’t. So, I had to go back to my table, put the pizza on the box and take it BACK to the counter and show him that it wasn’t. He rolled his eyes and handed me a bigger box. I have never written a review in my life, but I sure wish someone had writtten a review like this so I would have saved my time, money, and a rare night out. We moved to Central Ohio 12 years ago after visiting several times. We specifically bought a house near Wholly Joe’s so that we could walk there whenever we were in the mood. The food is that good. We have never been disappointed.